I have an addiction I admit it. I am sorting through 25 pounds of uncarded fleece. Some of it is dyed, some not. All of it needs to be pulled or picked, meaning I grab a lock and start pulling small amounts from the whole, sorting out the grass and undercuts. So a certain percentage, maybe up to 30% could be lost. The undercuts and bad bits will be used to line clay planting pots to help retain moisture, unless the dye was toxic. If it was toxic, it just gets pitched. Fleece is biodegradeable. Dyes that contain chemical elements, like lead or arsenic, well, an element cannot be broken down. I try not to use any. Today there was a lot of difficulty. The fleece had been washed but not at a high enough temperature. It has started going sticky. Sticky* fleece is really hard on your shoulder muscles when pulling. The tips were yellowish and poor quality, either from too much sun or laying in urine. So in addition to pulling sticky fleece apart, I checked to see if I could break off the tips. They didn't break so no damaged fiber. I have no idea where this fleece came from. It's listed as personal, not purchased for the business in my records. It could be 20 years old or it could be something I bought with my personal money to make a sweater for myself. It's in good shape for spinning. I am mixing it with a really dry fleece and some silk in the same color hue. 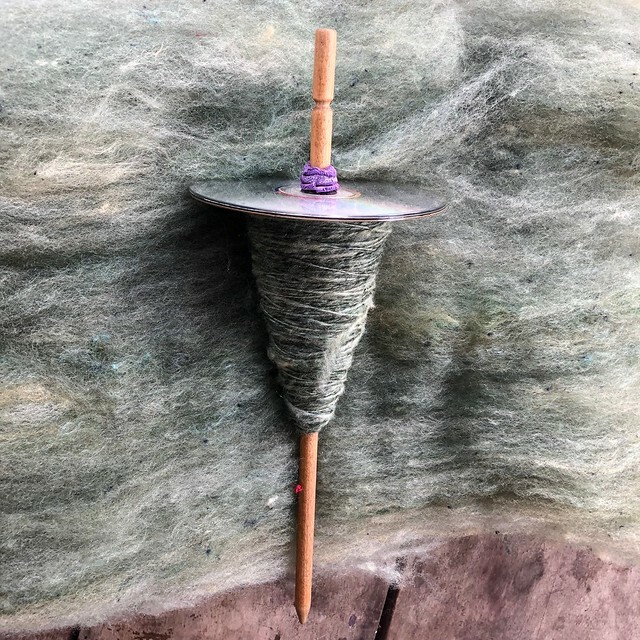 Although my pulled fleece goes on the drum carder to get blended, I can see the benefit of having wool combs to do a lot of this work. There isn't too much debris but I've watched people with combs. It could be easier. Still think my shoulders would hurt just as much. As I was sorting fleece, I found some Dorset from Virginia that I bought one Gulf Wars. Dorset is soft and fluffy but this one is cut almost too short. Think of curly hair on a super humid day. A lot of it goes straight into the scrap collection, just too short. I had been interested in exploring different breeds to see which I liked the most. Dorset produces a very soft stretchy knitting yarn. It really doesn't felt at all. I'm adding it for color and softness. As I sort through more fleece, I found Cosmo. Cosmo was a Romney/Coopsworth cross lamb. I really liked the way dye always varied across a lock of Cosmo's fleece. So pretty. Very little of Cosmo is left in my stash. Cosmo was easy to pull. Cosmo came from North Carolina. In talking to the farmer, he has his sheep sheared three times a year. I went for a lamb's first shearing because I found most fleeces at SAFF were prickly. Think of how it feels when you get your hair cut frequently. The shorn pieces that get down your shirt are very itchy. Not what I want in a fleece. I've talked with other farmers, twice a year is more typical and allows the ends or tips to smooth out naturally. Obviously, the further north that a sheep lives, the fewer shearings. I also found some roving called Rainforest by Hidden Valley in Wisconsin. I love their dyes. They also do mohair blends but I am avoiding mohair, too scratchy. Rainforest is wool blended with silk. It has lots of slubs so by blending it, I get a smoother yarn and gorgeous color. Somewhere in there I have another dark gray fleece that is kind of murky by itself. No clue how old or where it came from. 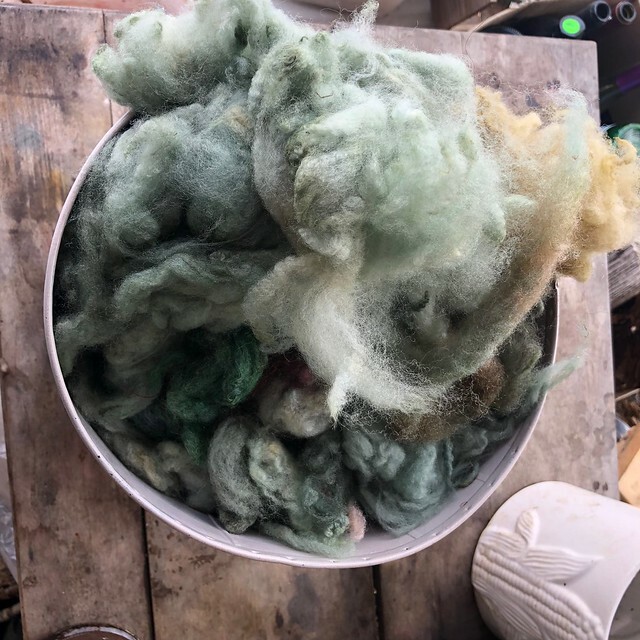 Blending this dark fleece in small quantities deepens my whole batt and gives it complexity. When I moved to Pittsburgh in 1992, Mistress Ryah invited me to learn how to clean fleeces at her place in Butler. When I took a temp job in Vermont in 1994, I was invited to a Living Histiry gathering at Fort Ticonderoga in NY. I brought a drop spindle and a small project to pass the time around the campfire. A wonderful gentleman brought me an entire feedsack of fleece that his landlady said she could not sell, the current market price being too low. She told him to find a spinner at the gathering and give it away. That the spinner would be forever grateful. And I am. I carded, spun and dyed my very first knitted sweater out of that fleece. It still keeps me warm on the coldest of winter days. I'll hazard a guess that I finished the sweater in 1997 or 1998. So most of my collection started after the completion of that project. I did buy two gray fleeces to get started from Mistress Ryah. One is hairy and the other short and curly. The breed is Bulter Domesticus, ie mixed or mutts. Although I processed (washed) them, I never carded them. The hairy one is going into the garden this year. The other is slated to be carded very soon. It looks to be in great shape. It might even get dyed in an indigo bath. Stay tuned because that's a project for another day. * Footnote: The stickiness will sort itself out when I set the twist in the spun yarn. I did a sample and found that by heating slowly and using washing soda or Dawn dishsoap, the stickiness comes out. This is not always true. Test samples are important. Also, if your yarn comes out too dry or damaged, you can always use hair conditioner to fix it up. But you must do this every time you wash your finished garment. Apply the conditioner in the same manner as you do your own hair.